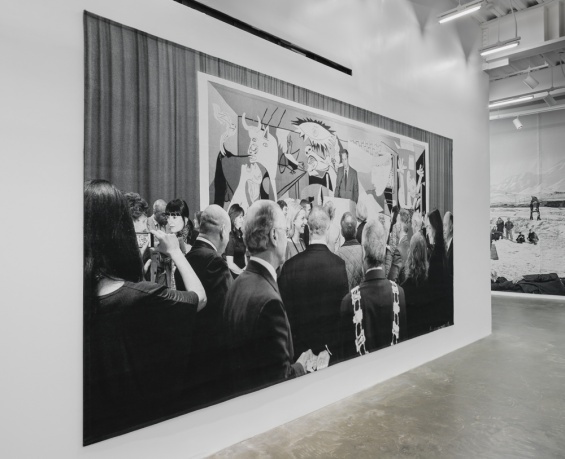 In the exhibition “Goshka Macuga: Time as Fabric,” Macuga’s recent large-scale tapestries and installations represent an accumulation of archival research, institutional histories, and narratives of art-making and the use of images throughout time. During this month’s New Perspectives tour, we will focus on Macuga’s The Nature of the Beast (2009), an early tapestry that raises questions about the role of art in global politics through the mobilization of Pablo Picasso’s iconic painting Guernica (1937). We will discuss Macuga’s use of Guernica in order to consider how an image may amass power and changing interpretations throughout time and across mediums. New Perspectives tours are led by the New Museum Teaching Fellow, an emerging scholar in art history or a related field. The topics of the tours are based on the Fellow’s ongoing research and change monthly, engaging participants in uniquely focused examinations of selected objects and installations. To read descriptions of current and upcoming New Perspectives tours, please view the calendar . New Perspectives tours are free with Museum admission. Due to limited capacity, please preregister here. The current New Museum Teaching Fellow Maggie Mustard is a PhD candidate in the Department of Art History and Archaeology at Columbia University, where she is completing her dissertation on postwar Japanese photography.